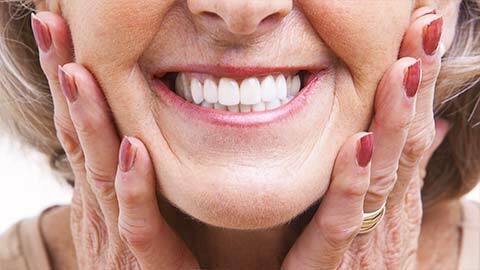 Dentures are a common solution to replace one or more missing teeth. They come in two types: partial dentures that replace one or multiple missing teeth, and full dentures that replace an entire row of missing teeth. If you lose a single tooth, or if you have multiple missing teeth, a partial denture can provide a natural looking replacement. A partial denture consists of one or more synthetic replacement teeth attached to a denture plate. The denture plate is designed to fit the inside of your mouth comfortably while providing enough support to the artificial teeth to keep them in place. The replacement teeth are shaded to blend in with your natural teeth. If you’ve lost an entire row of teeth, or if you only have a few remaining teeth in a row, you may want to consider a full denture to restore your smile. A full denture is an entire row of artificial teeth mounted to a denture plate. Full dentures are designed to stay comfortably in place while you chew or speak. 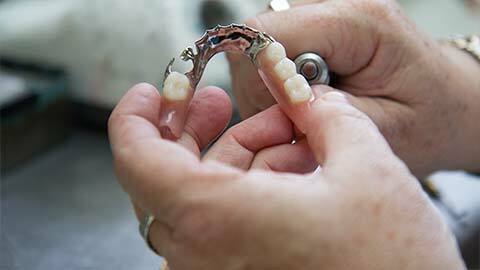 Options to secure your dentures include denture adhesives and implant mounted dentures. Implant mounted dentures, or overdentures, are removable dentures that are secured to dental implants placed in your jawbone. These dentures are very secure and won’t shift while you eat or talk. If you need dentures, or are considering dentures as an option to replace missing teeth, call our office to book a consultation.